We will offer our highest prayer for people who have been harmed by clergy abuse. This Mass for Justice, Healing and Peace will be followed by a program on Restorative Justice, and an introduction to Healing Circles. Vouchers for two hours of free parking in the Riverplace parking ramp on 2nd Street SE by the church will be available. The Together in Hope Project has orchestrated three concerts in Rome and an entourage of ecumenical visitors, including 64 choir members and 120 goodwill ambassadors. Standing in front of the conductor’s podium will be Teri Larson, music director of the Basilica of St. Mary in Minneapolis, and Mark Stover, who recently was the conductor of the St. Olaf Chapel Choir in Northfield. 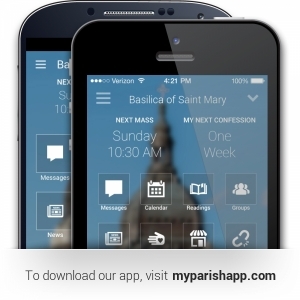 Our new Basilica of Saint Mary app is now available to download for iPhone and Android phones. Stay connected with notifications, community events, prayers, daily readings, Mass reminders, and much more. We expect the features and capabilities of our new app to foster a stronger sense of community and faith in the daily lives of all parishioners. The Basilica will be able to communicate quick and easy with all parishioners via messages and notifications to keep you in the loop with what is going on in our parish. The Basilica of Saint Mary will show the film Summer in the Forest, Saturday, October 27, 2018 at 3:00pm. This highly acclaimed, documentary tells the story of L’Arche, an international federation dedicated to the creation and growth of homes, programs, and support networks with people who have intellectual disabilities. Founded in 1964, today it operates in 147 communities in 35 countries, on 5 continents. This screening is presented by the Disability Awareness Ministry as part of the Basilica’s Disability Awareness month in October. The Disability Awareness Ministry's mission is to remove barriers that prevent the full inclusion of individuals with disabilities and their families in parish life and in the community at large. The Basilica continually strives to make the church and campus facilities accessible to all parishioners and visitors. We begin this month of remembrance with solemn Evening Prayer for all our beloved dead. The names of all those who have died within the last year will be mentioned during the Litany of the Saints. All other names of the faithful departed will be listed in the worship leaflet. If you wish to include names of the faithful departed, please submit names online at mary.org/allsouls or call Wendy at 612.317.3474 by end of day October 25. Evening Prayer for All Souls Sunday, November 4, at 3:00pm. The Disability Awareness Ministry's mission is to remove barriers that prevent the full inclusion of individuals with disabilities and their families in parish life and in the community at large. The Basilica continually strives to make the church and campus facilities accessible to all parishioners and visitors. Join us as we continue to look at ways to eliminate barriers to participation at The Basilica. A service of mantra-like singing following communal prayer focused on reconciliation and healing. Braille Leaflet, wheelchair seating, lighting for those with visual impairment are just a few of the ways we are making this prayer service more accessible to all. Come down to Teresa of Calcutta Hall for special treats and resource tables featuring organizations with information on breaking down the barriers to participation on many levels. If you have an organization you would like to participate, or for more information, contact Janet. This highly acclaimed, recently released documentary tells the story of L’Arche, an international federation dedicated to the creation and growth of homes, programs, and support networks with people who have intellectual disabilities. It was founded in 1964, and is operating today in 147 communities in 35 countries, on 5 continents. Doors open at 2:30pm and special treats will be available. Before coming to see Summer in the Forest, we invite you to join us in reading The Road to Daybreak by Henri J. M. Nouwen. This book documents the author’s spiritual journey that took him to the L’Arche community in Trosly, France and the impact it made on him for the remainder of his life. If you would like to purchase a copy, please contact Janet. For more information, contact Janet. Archbishop of Damascus Samir Nassar will discuss from his eyewitness perspective the impact of Syria’s civil war on both the Church and society in that country. St. Paul/Minneapolis - His Excellency, the Most Reverend Samir Nassar, Archbishop of Damascus since 2006, has witnessed first-hand the devastation caused by the civil war raging in Syria since 2011. No sector of society has escaped unharmed, including the Church. Families, children, and especially young people, whose future livelihood within Syria has become precarious, have suffered the most. Over two separate events on Thursday, November 15, Archbishop Nassar will share his experiences helping his church communities survive and constructively respond to the barbarities and deprivations of war. Both events are free and open to the public. The first event is an informal discussion with Archbishop Nassar, entitled “Enveloped by War: The Church in Syria’s Civil Conflict.” It will be held in the auditorium of the O’Shaughnessy Educational Center on the St. Paul Campus from 11:45AM to 1:15PM. Archbishop Nassar will share stories, and invite questions, about how the war has affected churches in his Archdiocese, and throughout Syria, and how both he and those churches have responded to the almost complete breakdown of civil society. The second event will be a panel discussion and public dialogue on how the Church in Syria might contribute to the rebuilding of Syrian civil society. “Binding Wounds, Building Bridges in a War-Ravaged Land: An Evening with The Most Reverend Samir Nassar, Archbishop of Damascus,” will take place at 7:30PM in Schulze Hall on the Minneapolis campus of the University of St. Thomas. This event will include many members of the wider Twin Cities community. The primary sponsor for both events is The Institute for Catholicism and Citizenship at the University of St. Thomas, with assistance provided by the University of St. Thomas’ Office for Mission, the Departments of Theology, History, Justice and Peace Studies, and Catholic Studies. Archbishop Nassar’s visit to the Twin Cities is being sponsored by a number of different national and local agencies and organizations: Catholic Relief Services, Maryknoll Fathers and Brothers, the Archdiocese of St. Paul/Minneapolis, the Center for Mission, St. Maron’s Maronite Catholic Church, and the Basilica of St. Mary. Come together to pray for peace and for refugees. Discussion about how the Church in Syria might contribute to the rebuilding of Syrian civil society. 1. Our End of Year Review and Our Operating Budget for the Next Fiscal Year: A four page summary of our Year in Review report is included in this bulletin. The full report is available online. In an earlier bulletin I had mentioned that while we were running a little behind in our budgeted revenue for the past fiscal year, we were also slightly under budget in regard to our expenses. We ended the fiscal year with a small deficit, which was covered by using a portion of the school rental income. The remainder of the school rental income was transferred to our cash reserve. I am grateful to our staff for the terrific job they did in reducing and controlling expenses. I am also grateful, though, for the ongoing financial support of you, our parishioners. Your generosity is a blessing for our parish. As mentioned above, the full copy of our year review is available online at mary.org. You can also call our Development Office if you would like to receive a printed copy. Finally, because of your generosity, in our budgeting for next year—we are anticipating a small increase in our revenue. This is good news and a testament to your care for and commitment to our parish community. As your pastor, I want you to know of my gratitude for your ongoing generosity. Please know it is greatly appreciated. We will kick-off a year long celebration of our 150th anniversary on Sunday, September 30. Archbishop Hebda will preside at the 9:30 and 11:30am Masses that day. Throughout the coming year there will be a variety of events, activities, and exhibits to celebrate our Sesquicentennial as a parish. I invite you to attend as many of these as you are able as we celebrate 150 years of faith. 3. Maintenance Projects at The Basilica: As I mentioned in an earlier bulletin, we tackled several maintenance projects on our campus this summer. As I hope you noticed from the scaffolding, we tuck-pointed the stone under the dome. As I write this column we are in the process of upgrading the kitchen in the lower level; we will also be doing some upgrades to the church sound system; seal coating and re-striping the parking lots; and replacing the florescent lights in the lower level of the Church with LED lighting. We will also be replacing the lighting on the interior ring of lights in the dome with LED lighting. This was the fund-a-need project at this year’s Basilica Landmark Ball. We also hope to reconstruct the South entrance to our school building sometime next spring. 4. Special Collections: While no one is fond of special collections, it is heartening for me to report that the people of The Basilica have been very generous to the last few special collections here. On the weekend of June 17 and 18, $7,400 was contributed to help defray the cost of air conditioning The Basilica during the hot summer months. On the weekend of July 28 and 29, $10,835 was contributed to help fund our St. Vincent de Paul Ministry. The contributions to these collections testify to the generosity of the people of The Basilica. Please know of my gratitude for your generous response to these collections. 5. Financial Stewardship: During the months of October and November we celebrate Financial Stewardship. During this time we ask all parishioners to make a pledge of financial support for our parish. While I am very much aware of the many requests we all receive for financial support, I am hopeful, though, that The Basilica will be near the top of your list in terms of your financial support. It is your ongoing, regular financial support that makes it possible for us to offer the many programs, services, and ministries that are at the heart of our Basilica parish. 6. Archdiocesan Bankruptcy: As I hope you are aware, earlier this summer an agreement had been reached to resolve the bankruptcy of the Archdiocese. The agreement establishes a trust fund of approximately $210 million for the victims/survivors. Some of the money for the settlement fund came in the form of voluntary pledges of financial support from parishes and priests of our Archdiocese. I believe this is a wonderful statement of our compassion and support for our brothers and sisters who were seriously wounded and hurt by my brother priests and by others in our church. In a letter to all parishioners several weeks ago, I said that The Basilica of Saint Mary was one of the parishes that made a confidential pledge of financial support to the settlement fund. This decision was made in consultation with our Parish Council and Finance committee. After setting a range for this contribution, they directed that our Parish Trustees and I make the final decision as to the amount of the contribution. The money for this pledge came from our parish reserves, which are funded by the rental income from our school building. Our financial pledge won’t be payable until the details of the settlement are finalized. It is our hope that making this pledge of financial support will send a strong message of solidarity and support to the victims/survivors. 7. Parish Packing Event: After the Masses on Sunday, August 12 numerous people came together to help put school supplies into almost 200 backpacks for students at Ascension School. The school supplies were collected throughout June and July. These backpacks helped students at Ascension School start the school year off with the supplies they needed. Many thanks to all those who contributed school supplies during June and July, and to the numerous people who helped put them in to the backpacks. 8. The Current Situation in our Church: As I said in a letter to parishioners a few weeks ago, lately it has been hard to be a Catholic. There have been accusations of sexual abuse and other sexually inappropriate behavior against former Cardinal Theodore McCarrick. Additionally, a grand jury in Pennsylvania released a report about the widespread sexual abuse of children by priests in six dioceses in Pennsylvania. And most recently (at least as I write this column at the end of August) the former Apostolic Delegate to the United States, Archbishop Carlo Maria Vigano, wrote a letter highly critical of Pope Francis and several other Church leaders. In the first two cases, it appears that those who were in positions to do something bear both legal and moral culpability for their inaction. In regard to the letter from Archbishop Vigano, it is suspect in that Vigano accused Pope Francis of lifting sanctions against former Cardinal McCarrick that had never been put in place. In the face of this situation, it would seem that there is very little I, or any other priest or bishop, could or should say. And yet to say nothing could be misconstrued as acquiescence to or acceptance of this situation. And so I offer two brief thoughts. First, while our church is facing a very difficult time in its history, I believe that ultimately it will emerge purified and more humble. I say this because it is our belief that the Holy Spirit remains with and guides our church until the end of time. And I firmly believe the Spirit will not allow our church to deviate fundamentally from the truth of the Gospel, from its mission, and from its life of faith. We call this charism: “Indefectibility.” Certainly, our church has veered off course in the past. And clearly a course correction is called for at the present moment. Ultimately, though, because of the guidance of the Spirit, I have to believe that our church can’t go into fundamental error. Second, as I said in my homily a few weeks ago, I realize that for many people the above revelations have caused them to lose faith in, and in some cases to leave the Catholic Church—at least for now. I am deeply saddened by this. At the same time I understand and respect their decision. For me, though, the Catholic Church is my home. It is too much a part of me to let it go. I cannot live without the Eucharist. I need the Eucharist to live as a follower of Jesus, and I need the faith of the community to make the Eucharist real and alive in my life. The Catholic Church is my home. I can have no other. MINNEAPOLIS, MN – The Basilica of Saint Mary celebrates 150 years as a parish with the Sesquicentennial Celebration Masses Sunday, September 30 at 9:30am and 11:30am with Archbishop Bernard Hebda. The parish was founded in the “Shed Church” in 1868 near the west side of the Mississippi River and has continued to grow and thrive for 150 years. The Basilica’s vibrant community, with over 12,800 members, will mark the historic anniversary with a year of celebrations, events, and art exhibits. Throughout the history of the parish—including two locations, three churches, and eleven pastors – there have consistently been the people who have lived and worshipped here as a community. Over the past 150 years, the parish has always been a home to immigrants, committed to serving people in need, and a community of hope. “This anniversary is about celebrating the Basilica community—the people of the parish, not the building—as a spiritual home, a place of peace, and a place of refuge for 150 years. We plan to not just look back, but ahead to the future growth and needs of our parish,” said Fr. John M. Bauer, Pastor of The Basilica of Saint Mary. The Celebrations will include large entrance processions along with music from The Basilica Cathedral Choir, Mundus Contemporary Ensemble, organ, and brass ensemble. Archbishop Bernard Hebda will preside at both Masses and all past priests who have presided over the years at The Basilica are invited to attend. The public is welcome to attend. The Basilica of Saint Mary, located in downtown Minneapolis, is a welcoming Catholic community committed to the well-being of the city. It is a center for the arts and a place of refuge for the poor. The Basilica provides quality liturgy, religious education, pastoral care, and hospitality to all. The parish is the spiritual home to over 6,500 families of all ages, races, ethnicities, and economic backgrounds. Right now, the Catholic Church desperately needs an independent structure, led by experienced lay personnel, to investigate and review allegations made against bishops, archbishops and cardinals – and not just priests, as is the case in many dioceses throughout the United States. As a practical matter, bishop-led investigations have mixed credibility in the public domain: some inevitably believe the accused bishop is being treated unfairly; others believe he is receiving preferential treatment. A fair resolution becomes unachievable. The accuser deserves better. We all deserve better. I am acutely aware of this, because I was personally involved, along with Bishop Lee Piché, in guiding the investigation of Archbishop John Nienstedt in 2014. In retrospect, it was doomed to fail. We did not have enough objectivity or experience with such investigations. Nor did we have authority to act. Throughout our efforts, we did not know where we could turn for assistance, because there was no meaningful structure to address allegations against bishops. In the case of Archbishop Nienstedt, in early 2014, Archbishop Nienstedt asked his subordinates to conduct a review of allegations against him. When affidavits containing serious allegations of misconduct by Archbishop Nienstedt with adults were brought forward, Bishop Piché and I tried our best to bring them to the attention of people who might have authority to act and guide the investigation. This included the then nuncio Archbishop Carlo Maria Viganó. When Bishop Piché and I believed that we were being told by the nuncio to close the investigation, we strenuously objected. When the nuncio clarified that we should focus the investigation and complete it, we did so. Although there were internal disagreements about how to complete it, Bishop Piché thought it best to hire a second firm to complete the review, because Archbishop Nienstedt contended the first firm had been unfair to him. Father Daniel Griffith strongly disagreed with that decision. During this long period, on more than one occasion, I counseled Archbishop Nienstedt to resign for the good of the Archdiocese. Throughout this process, there was confusion about who was ultimately in charge and what should be done to ensure a fair outcome. I think that Bishop Piché believes that the investigation was completed to the best of his ability. I understand the strong frustrations expressed by Father Griffith, whom I believe acted in good faith and with sincerity and integrity. We all did the best we could in a difficult situation. In contrast, today we are better prepared. When there is an allegation against a bishop or archbishop in our Archdiocese, it is reported to the Board of Directors, lay people. They play a vital role in making certain that all allegations are investigated and addressed. I believe that a similar approach utilizing lay expertise is necessary on the national level. An independent national review board would result in a more fair process for holding the hierarchy accountable. In this way, there will be more confidence in our Church leaders in the future.